Do I want to go swimming with dolphins? 🙂 There is a wonderful childlike exuberance in this card. The child is relishing its moment on the waves and doesn’t seem scared at all. It is a time of plunging into new experiences without thought to outcome but simply enjoying the process. Riding the wave and seeing where it takes you. I definitely need to develop this approach – I used to throw myself into new experiences without worrying about outcomes when I was younger. I had a real zest for life and wanted to explore. With adult responsibilities, I’ve become much more cautious. Time to let the child out to play. Lots of creative processes going on in this card. We have a painter, someone drawing, a stonemason and someone who looks deep in thought. A figure stands at the front handing out olive wreaths. This is Athene. It is about valuing your talents, feeling secure in your self-worth and working to make your ideas tangible. There is a pleasure in the process of creation and a practical approach. 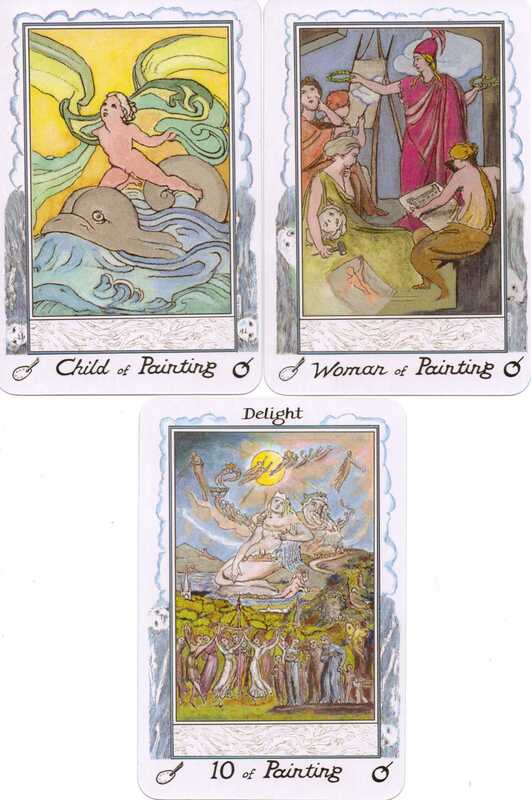 🙂 I did pull these cards completely randomly and have ended up with a triple whammy of Painting. Time to pay attention to this area. This card’s subtitle is ‘Delight’ and it shows a group of people celebrating merrily. There is great joy and a sense of completion in this card. Earth and Heaven have come together. I can celebrate my good fortune and prosperity. Not only that, but the other two cards together with this one, strongly suggest that I can be the architect of my own prosperity. Keep a lighthearted, joyful outlook, combine it with a practical application to make those ideas a reality and prosperity is the result. Here in the UK we are currently experiencing a drought. It can be hard to believe this happens in a country which has a reputation for soggy weather. 🙂 Nevertheless, after a very dry winter, some regions have been told that they are officially in drought. This means no use of hosepipes to wash cars or sprinkler systems to water gardens. Yesterday evening we experienced our first significant rainfall for ages. It came down so hard, you could hear it clattering on the windows and doors. Stepping into my garden this morning, everything feels refreshed. This is such an interesting card to come up. I’ve been reading a book called 12 Steps to Compassion by Karen Armstrong and forgiveness is a key idea. Like many people, I can forgive others most things (although there are still some things which really push my buttons) but find it hard to be quite so forgiving of myself. I’ve been wondering why that is…why do I merit less compassion than other people? 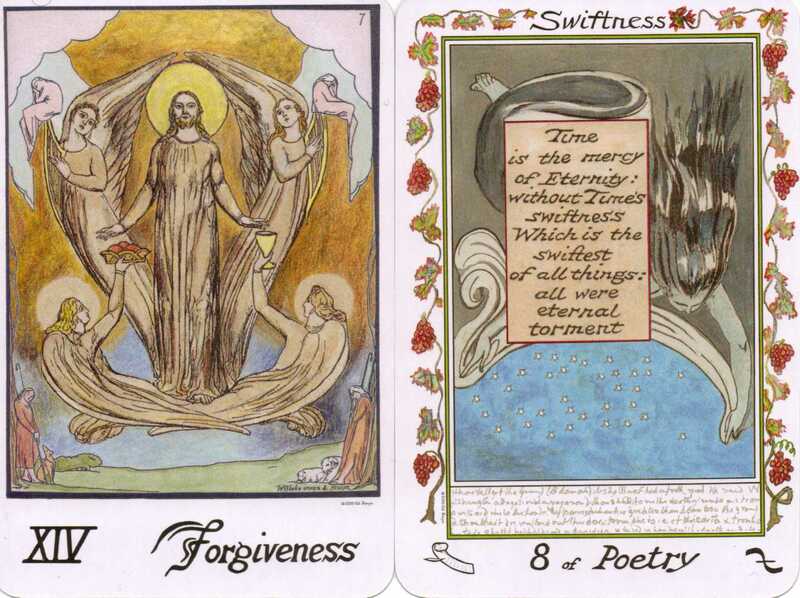 This card has Jesus as a central figure who Blake saw as a personification of human imagination – the divine spark in us all. Forgiveness as an action is the beginning of healing. This card represents the ability of imagination to transcend the limits of our temporal world. It finds meaning in the universe and tries to communicate this. It’s a time of energy and falling in love with work. The mind races with ideas and time seems to alter as you work with them. It passes quickly, ‘2 hours already!’ or seems to stretch so that you can fit more in. Time as we usually measure it ceases to exist. Timely coincidences, great energy and fast communication of ideas are indicated. I’m looking forward to 2 weeks off work and I’d like to use this time to work on my writing. This is a simple 3 card spread to get me reflecting on my writing skills. 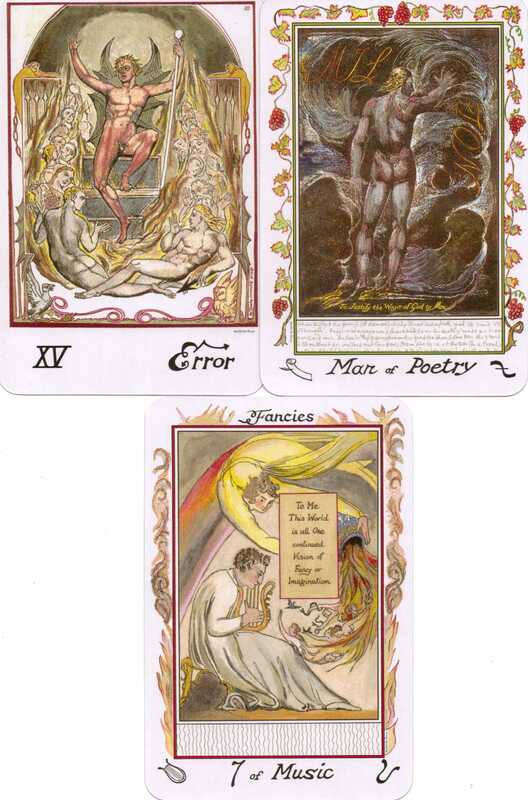 I’m using the William Blake tarot created by Ed Buryn. This card represents those moments of sudden clarity, where the ‘Big idea’ suddenly hits. There is a clear sense of purpose to the story and an over-arching theme which ties it all together. It makes perfect sense for this to be here. I wrote my current project as part of Nanowrimo as a way to get past my procrastination and inner critic. It was extremely valuable to force myself to write even when I didn’t really feel like it or when I would usually make an excuse not to do it. However, going back and editing this piece of writing, it is obvious to me that I haven’t communicated the ‘Big idea’ in a way which is clear to others. This card is subtitled ‘Fancies’. It is an urging for me to explore the realm of imagination, to allow the alternate reality I’ve created in my story to really take over and speak. Exploring different possibilities and allowing my flights of fancy to find a concrete expression is important.